Printed circuit boards are widely used in various sectors like military, industrial control, telecom, consumer electronics, medical, automotives, etc. Its main function is to make all kinds of electronic components form a predetermined circuit connection, playing the role of relay transmission. Printed circuit boards are called "the mother of electronic system products," that’s because they are used in almost all electronic devices. PCB board in accordance with the conductive graphics layer can be divided into: single-sided, double-sided and multilayer boards. Single-sided board is the most basic printed circuit board with components on one side and wires relatively concentrated on the other side. A double-sided board is a PCB board that has wiring on both sides with a proper electrical connection between the two sides. This solves the problem of interleaving wiring in single-sided boards and can be used on more complex circuits. 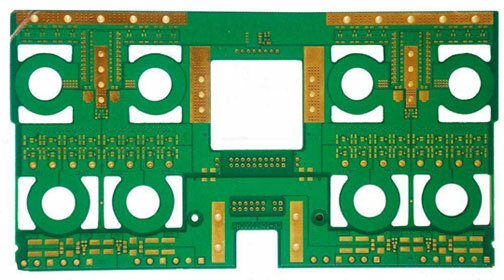 Multilayer PCB refers to the PCB with four or more conductive patterns. The number of multilayer PCB is usually even. The higher the layer number, the complicated the technical requirements but with more supported functions . PCB board material can be divided into rigid board, flexible board, and rigid-flex board. Rigid board is not easy to bend which are widely used in electronic products. Rigid board substrates are generally fiberglass substrate, thermoplastic substrate, composite substrate, ceramic substrate, metal substrate, paper substrate, etc. Flexible board is a board using flexible insulation substrate, which can bend, fold, and wind according to the installation requirements. Flexible substrates include polyimide substrates, polyester substrates and the like. Rigid-flex board is composed of rigid board and flexible board laminated orderly, then form a metal hole by electrical connection. Thus, it can meet the three-dimensional assembly requirements. Rigid-flex board greatly saves product interior space, reduces the volume of finished products, and improves product performance. 3.Classification according to special boards. HDI board refers to high-density interconnect technology, whose general manufacturing method is a laminated way. HDI board use conventional multi-layer board as the core board, then layer by layer add insulation and circuit layer (also known as laminated). Then use laser drilling technology on the laminated layer so that the entire printed circuit board will form a blind hole which used as the main conduction mode of the interlayer connection. HDI board can greatly improve the wiring density of the board, and make PCB products much smaller and functional.